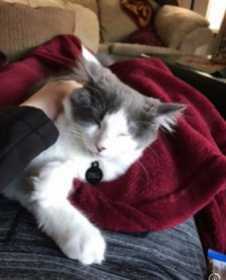 Very sweet male grey&white long haired cat, fixed. Last seen off Rickard & Hwy 20 in Bend. He was wearing a collar with his name and my number on it. He ran off during our move and we miss him very much! Please help us find our baby!